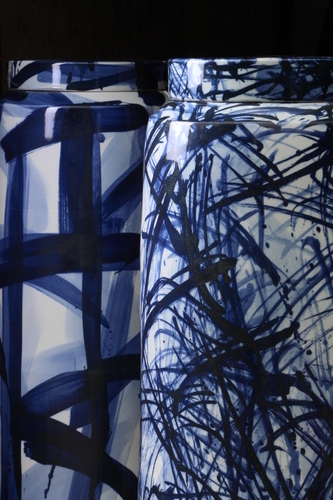 This entirely new collection of 14 works in Porcelain is an exploration of Blue and White painting onto large scale ceramic forms, an ongoing concern in Aylieff’s work. Working in Jingdezhen, the historic home of Chinese porcelain, she developed a strong relationship with porcelain factories; the knowledge and expertise gained from this cultural exchange enabled her to work in an unprecedented way. Taking up opportunities for reinterpreting traditional Chinese production techniques, she improved former designs for stacking techniques using wheel thrown sections, that gave the potential to create works monumental in scale (the tallest being 4.6m). The introduction of simple lidded forms, uninterupted in outline affords the pieces contemporary sensibilities, whilst also referencing aspects of traditional Chinese ceramic form. Whilst a number of works represent a bridge between earlier and newer approaches to the painted surface, through their establishment of technique, others explore innovation in surface treatments. These extended Aylieff’s vocabulary of painting and mark making using a range of ‘blue’ tones, achieved through the layering of marks made using specific dilutions of oxide applied with a long split bamboo or ‘whip brush’ designed by the artist. This ‘brush’ dictated that marks must be made at speed, with its length giving limited control to the painting, generating a reactive approach to mark making. The overall result sees the development of a personal expressive language in ceramic painting/drawing, giving an animation to the surface and an energy to the work. 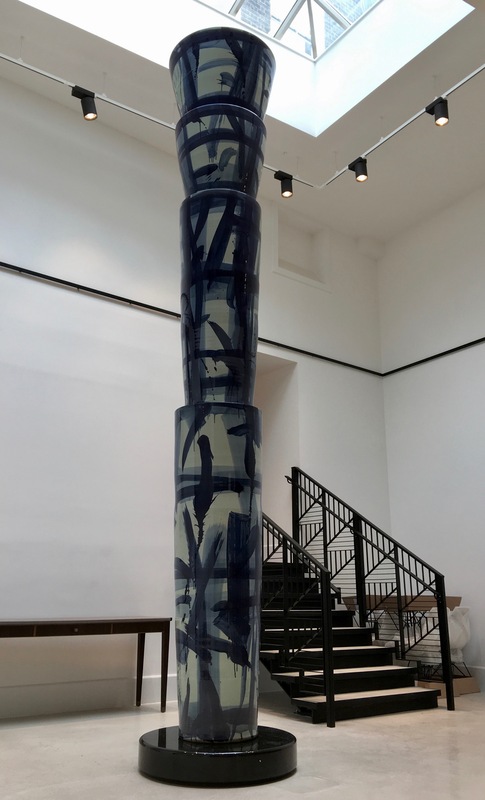 The artist was invited by LINLEY, internationally known for creating furniture, accessories and interiors of high quality craftsmanship, to hold the inaugural exhibition in the newly created gallery space within its Pimlico store, London. Seeking to reach beyond the familiar art gallery audience, it was a new departure for Aylieff that saw artwork sited within the context of the domestic interior. 152(ht) x 55 x 55 cms. 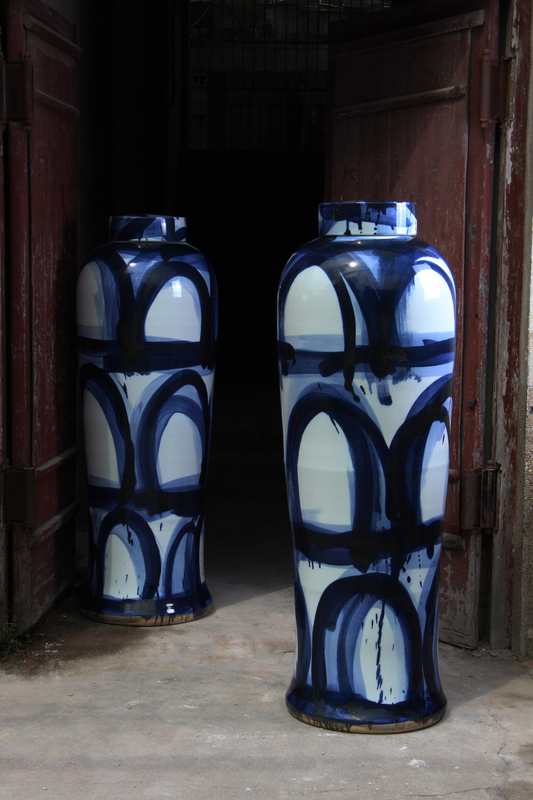 Thrown and glazed porcelain, hand painted with Cobalt blue oxide. 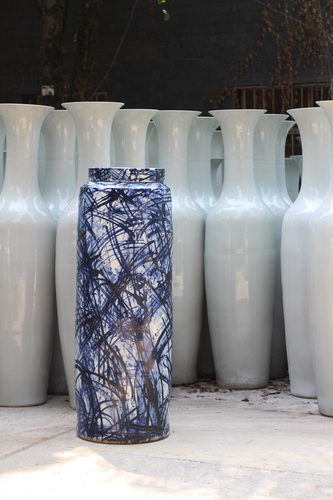 Thrown and glazed porcelain, hand painted with Cobalt blue oxide. 460(ht) x 87 x 87 cms. Thrown and glazed porcelain, hand painted with Cobalt blue oxide. 51(ht) x 27 x 27 cms. Thrown and glazed porcelain, hand painted with Cobalt blue oxide. 146(ht) x 54 x 54 cms. 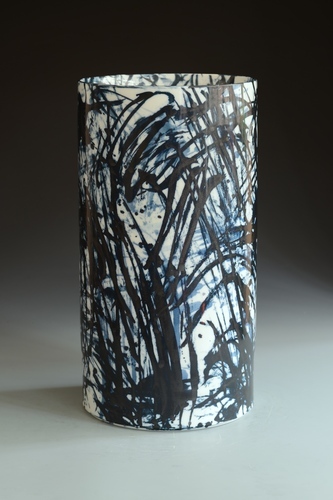 Thrown and glazed porcelain, hand painted with Cobalt blue oxide.